Recently, my kids (Piggy and Jem) had on and off fever and flu so I boiled a soup almost everyday to help them recover faster. This Chinese Yam Soup with dried scallops and goji berries was one of them. Chinese Yam (also known as nagaimo, cinammon vine and shan yao) is a type of yam in the Dioscorea family. They are long and cylindrical in shape with thin and hairy beige skin. The flesh is crispy and mildly sweet. Native to China, these yams are also grown in countries like Korea and Japan. Fresh Chinese yams are sold in Asian wet markets and supermarkets. The common varieties are from Japan and China with the former costing almost triple the amount. Grip the fresh Chinese yams firmly when peeling as they are slimy and slippery. I dropped them a couple of times while peeling. The dried version (called huai shan) feels like powdery chalks. They can be found in Chinese medicinal shops and also sold online. One thing that I’ll do differently the next time is to cut the Chinese yams into sections or rings instead of diagonally. Although it looked more interesting, I prefer to eat smaller pieces of the yams. 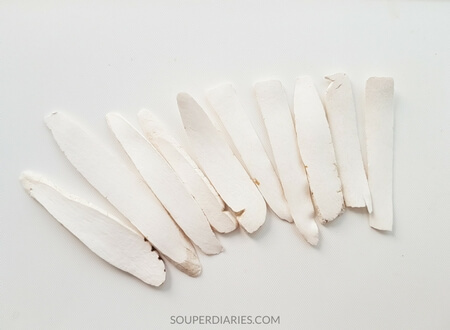 Both fresh and dried Chinese yam are commonly used for making Chinese soups. Fresh Chinese yams can already be eaten raw so it’s not necessary to cook them for a long time unless you like the yam to be very soft. Drop them into the soup pot during the last half hour (or less) of cooking so that they’ll retain the nutritional values and some crunch. 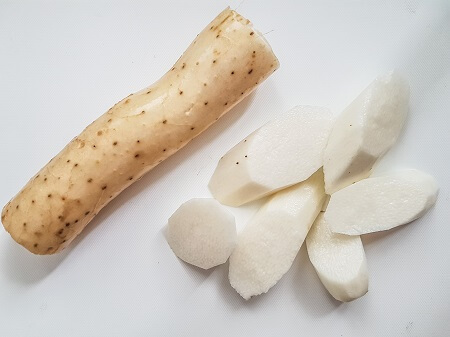 In Traditional Chinese Medicine, Chinese yam is used as a remedy for many conditions such as diabetes, diarrhoea, cough, fatigue, wheezing, frequent urination, poor appetite and much more. It is also known to enhance vigor, improve digestion and strengthen the spleen, kidneys and lungs. This clear Chinese yam soup is soothing with a light sweet flavor. Perfect for the hot seasons or after a greasy meal. Goji berries help to improve eyesight and promote healthy skin. This soup is gluten-free and suitable for both kids and adults. Enjoy! 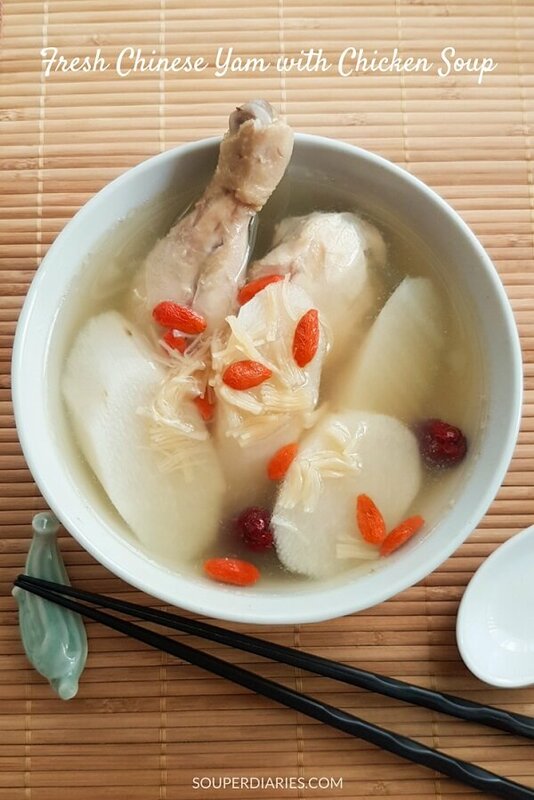 A clear, delicious and aromatic soup of Chinese yam with chicken, dried scallops and goji berries. This soup helps to replenish energy, improve eyesight and overall good health. Rinse chicken. Parboil the chicken in boiling water for 2 - 3 minutes to get rid of gunk and excess oils. 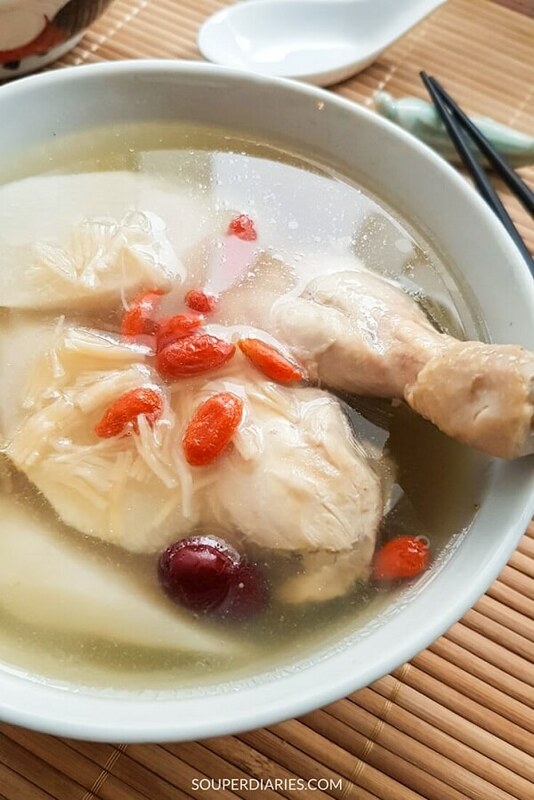 Place the chicken, dried scallops (with soaking water), dried red dates, dried honey dates and water into a soup pot. Bring to a boil. Once it boils, reduce heat to low and simmer for about 1.5 - 2 hours. Use an oil strainer to skim off excess oils from the soup. Then add Chinese yam and simmer for another 30 minutes. Add goji berries in the last 10 minutes of cooking. Salt to taste and serve. You can also add goji berries at the start of cooking but the soup won't be as clear looking. It is very interesting of your site about the different kinds of Chinese and Asian soups and different recipes of the main dishes. The view of your site is very home friendly, is easy to navigate and every blog is with corresponding images.